When it seemed that nobody cared about skateboarding, an extreme sport that has given us great arcades and simulators (and above all, many hours of fun), roll7 launched a game that returned us faith in the genre, and the once introduced a formula never before seen in games of this style. With OlliOlli 2, the study showed that success was no fluke, and that its ranks had much talent. Now they get off the skateboard and wielding a gun. It's been just over a year since this new project was announced, NOT A HERO, and after even with some delay, finally comes to us with a new offer: to revolutionize the system of coverage that popular Gears of War, adapting to both dimensions. This may remind many of CounterSpy, but Not a Hero is packed with ideas and personality. Not a Hero is an action game with a little touch of scanning in two dimensions, where you control different characters, each with their own skills, and try to defeat our enemies through scenarios where also await us other secondary missions. It is based on a number of reasonably short missions, which is highly recommended to get back to one hundred percent complete them. Its wild story tells how BunnyLord, an anthropomorphic rabbit from the future, wants to present an English town mayor, and our goal is to clear three different districts of criminals to show voters that a candidate is legit. So we become a kind of mercenary BunnyLord available in an adventure whose story unfolds through sequences of text (in English), quite slow, which will guide us to the next mission. The narrative is entirely expendable, but serves as a backdrop for the game, and even the characters are unlocked depending on the intention to vote to go getting. If we give the opportunity to "express" Not a Hero is quite funny, with a subtle, particularly absurd humor, which we think add value to its proposal. We will not deny that the games are to play, and that roll7 could have given us the option of at least accelerate the texts, since you all you swallow or their very slow pace or will the leave; there is no middle ground. With or without a history, Not a Hero begins with a tutorial very successful in which explains perfectly its basic mechanical, and leaves us little by little we discover the advanced. The gameplay is positively simple, and focused at all times the skill, intelligence and planning Player. With just three buttons we can do all actions of the game, and depth comes through a design that continues to surprise with each level. The proposal is also simple. With a button your character is released to the nearest cover and pressing the shutter button, it comes out. So does the enemy. For almost can execute with a single shot, and give an "entry" and knock them out on the floor and can finish them off before they get up. The basic shootings involve avoiding their bullets and hit with ours whenever overlook. Fortunately, the enemies are varied, and each has its own weapons and techniques that force us to go adapting and even learn their attack patterns. All are very distinct, so do not worry; you will recognize them well. Scenarios are a passive element of the gameplay that becomes a real problem. At first they are merely a circuit to go, but soon become an environment that we need to explore with his head. Go where we must not prevent us to get a goal, and force us to repeat the level if we get one hundred percent. That comes across very well on a level with which we show hostages in gameplay commented that offer where we have to use alternative routes to avoid the kidnappers see us and end the lives of the hostages. To all this must be added the multitude of weapons available. We have previously mentioned that in Not a Hero each of the nine characters has a slightly different gameplay, with a particular skill and its own weapon. For example, you allow us to dodge while doing a run, and another shooting while running. Unlock new characters it will also be important to complete certain challenges, so everything will gradually fitting to encourage us to constantly improve. We do not forget either the special ammunition and secondary weapons. Spread levels or left by the enemies to die, we can find a number of types of bullet that will allow us to make special, such as explosives or pass through the cover shots. We also have secondary weapons, usually thrown. These are collected in the same way, ranging from grenades turrets, through ... kittens pump. Not a Hero returns to bet on the pixel-art (or rather, per pixel) of OlliOlli original, and while its characters stand out as having much personality, scenarios pecan exact opposite. We have said that its design is great, but its appearance is repetitive and uninspired, and would not have gone more variety, especially when it is intended to be repeated many times. Do not disappoint the soundtrack, which is more than lived, and that leaves us humming melodies before we know it. Besides, we must add a good collection of sound effects and voices, usually parodies of a variety of accents. 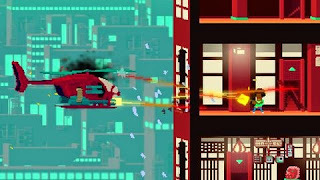 If anyone thought that OlliOlli was a fluke, with Not a Hero roll7 show that they know very well what they do, and bring us another game with a solid and well established, original and very addictive mechanics. Not a Hero is not a shooter frantic; action still is a game of measuring the shots, think head and demonstrates skill, to repeat each level to make it better than before and do what we could not do before. If you are looking for a different set of intelligent action, this is the right game for you.